Militant Cheerleaders On The Move is Sweden's new upcoming stars within the heavier electronic music and their single 'Freaks' have opened the eyes of many. The band with the long name is Per and Jonathan and they were what you could call the main act for Electromanifest in Jönköping. I met the duo and we talked a little bit about then, now and future in a group of flowery arm-chairs. Tell us more about yourselves and Militant Cheerleaders On The Move. Per: - "We started out about two years from now. I have always wanted to work with Jonathan and I've known him as long as I can remember. We found out that we liked the same music so we began to write some tracks. The first song we made was "Athletic" which also is found on our single." Jonathan: - "We had really thought it through." What bands influences you guys? Per: - "It's a lot of the classic EBM like Nitzer Ebb, DAF and the whole school you might say. It's nothing that we try to hide really. We are also influenced by acts that have nothing to do with EBM, but more of Techno related stuff. 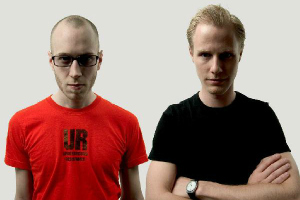 It's very easy to hear it when you listen to our sound that there are a lot of Techno references and influences." Jonathan: - "Of course there's a natural connection to classic EBM. It usually turns out that way when you are placed in a genre and you have to start out with that and work with that. I can't really say that I listen that much to that kind of music though. There's a lot of other music in rotation. Indie and rock for an example, maybe you can't here it in our music, but that's different story." Per: - "We know, but you can't hear it. I think it pass on to our lyrics and similar. I'm an old raver that started to listen to Techno back in '94. Later on I got more into EBM. I was about four years ago and that's were it all started." How did you come in contact with Memento Materia? Jonathan: - "We sent them a demo, well, rather four demos. Later on the called us and ask us if we wanted a contract." Do you have any other projects? Jonathan: - "I have earlier made something that you might call electronica, but it feels like that was a very long time ago. I have released my material on an independent electronica label, you might say. But it's on ice right now." Per: - "I have released some of my stuff on my own label called Bio Records and its techno related music. I have also released some more on another label called Backdrop which is located in Spain. I'm still quite unknown within the techno genre, so you have to grasp everything you can. I have also released some on a label called Mankind that is founded by Johan Backlund which is very big within Techno Sweden and around the world." Tell us more about your first single 'Freaks'. Jonathan: - "It was really formed from the demo we had to work with. We hade recorded five tracks or something like that, so we hadn't that much to choose from." Per: - "We had recorded one instrumental track and three ones with vocals that we were happy with, so finally there were three songs from those." Jonathan: - "It wasn't like you picked some special ones out; it was more like if they wanted to release the single they had to take what we had." Per: - "We had, like we said, written "Athletic" first and after that we made "Freaks" and "Work Is Violence"." Tell us more about your upcoming album. Per: - "The album will be released in November, the first or second week. I think it's going to surprise some people. Still there are many tracks that relates to the single, but some tracks isn't really what you expect. It's still a very homogeny album all the way and I think that the songs we've made this far is damn good. We aren't trying to make an album that sell in great numbers, we just going to make an album that we would by ourselves." Per: - "We do music. That is what we do." Jonathan: - "We do music." I hear talking people, especially politicians the whole day. They say that everything goes bad and will go more miserable. But what they are doing? Nothing! They want to change the government or laws. But at first everybody has to start to rethink and maybe change his own standpoints and behavior.